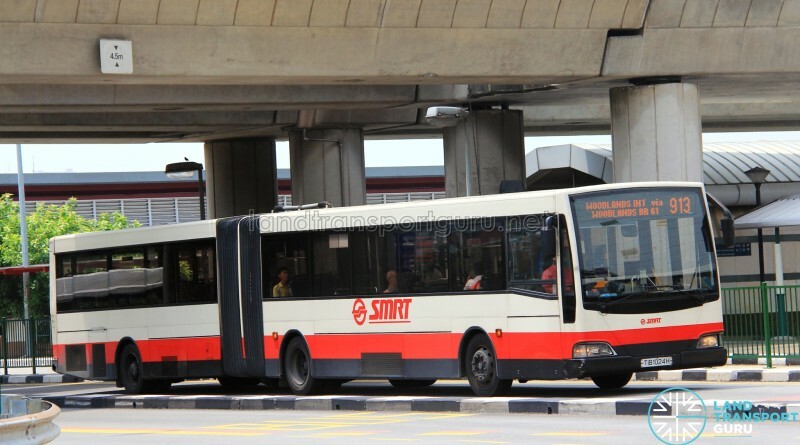 SMRT Feeder Bus Service 913 is a Feeder service operating from Woodlands Temporary Interchange and looping at both Woodlands Circle and Woodlands Avenue 3, passing through Woodlands Avenue 7, Woodlands Avenue 6, Marsiling Rise and Marsiling Road. It operates as a dual-loop service, calling at Woodlands Temporary Interchange twice in a single trip. Service 913 was amended to skip Woodlands Train Checkpoint, looping at Marsiling MRT station instead from 17 March 2019. It also serves Woodlands Street 11 and Woodlands Street 13. Service 913 plies both the East Loop (W’lands Ave 7, W’lands Ave 6 & W’lands Circle) and West Loop (W’lands Ave 5, Marsiling Rise, Marsiling Rd, W’lands Ave 3 & W’lands St 13). Service 913T buses will terminate at Woodlands Temp Int and will not ply the other loop. Feeder Service 913 serves residential blocks, schools and public amenities along Woodlands Ave 7, Woodlands Ave 6, Woodlands Circle, Marsiling Rise, Marsiling Rd and Woodlands Avenue 3, connecting them to Woodlands Regional Centre and key transport nodes such as Woodlands Temporary Bus Interchange, Marsiling MRT station, Woodlands MRT station and Admiralty MRT station. Its primary area of service is Woodlands Neighbourhood 7 on the East Loop, and Marsiling estate on the West Loop. 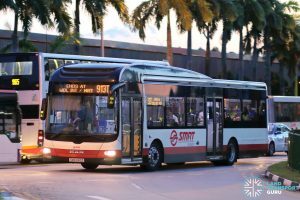 High capacity articulated buses as well as Double Decker buses are deployed on a daily basis due to high demand from residents in the area. The route serves schools such as Admiralty Primary School, Evergreen Primary School, Woodlands Secondary School and Marsling Secondary School. Other public amenities served include Woodlands Mart and 888 Plaza. 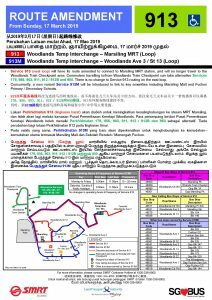 Service 913 operates in two loops, where buses will first ply the East Loop (via Woodlands Circle) followed by the West Loop (via Marsiling Road / Woodlands Ave 3), while calling at Woodlands Temporary Interchange between loops. Terminating trips will operate as Service 913T (Formerly 913E), indicating that the bus will terminate at Woodlands Temporary Int and no longer continue its journey on the other loop. There are two separate queue berths at Woodlands Temporary Interchange for Feeder 913; passengers should check their direction of travel before boarding the bus. During Eves of Public Holidays, last bus timings will be extended to complement the extension of train operating hours. During Eves of Public Holidays, last bus timings will be extended to complement the extension of train operating hours. From 19 March 2019, the West Loop of Service 913 was amended to loop at Marsiling MRT Station, skipping the Woodlands Train Checkpoint area while serving Woodlands Street 13. 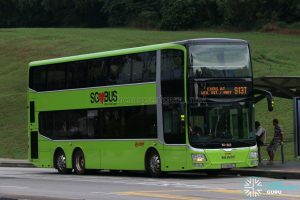 Route Variant Service 913M, looping at Woodlands Street 13 via Woodlands Avenue 1 was also introduced on the same day. Commuters travelling to/from Woodlands Train Checkpoint can take alternative Bus Services 178, 856, 903, 911, 912 / 912B and 950. There will be no change to Bus Service 913 routing on the east loop. 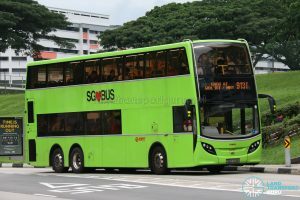 In addition, a new route variant Bus Service 913M will be introduced on the same day to link to key amenities including Marsiling Mall and Fuchun Primary / Secondary Schools. Fare: Distance Fares for Feeder Services are capped at 3.2km. See Bus Fares.